Beyond the basic three essential nutrients, Nitrogen, Phosphorous and Potassium (NPK), other requirements for plant growth and soil health are the secondary nutrients (S, Ca, Mg) and also micronutrients, which include iron, manganese, zinc, boron, molybdenum and copper. These secondary micronutrients are commercially available for agricultural application in many forms, including as enhancements to commodity forms of N, P and K fertilizers. Homogenous, granular micronutrient compounds are also produced and used either in direct application or as relatively minor components of bulk NPK blends. Secondary nutrients, especially sulfur, are often supplied in prilled or pastillated form. High magnesium and calcium analysis products are also commercially available in granular form. Like any particulate fertilizer materials, micronutrient fertilizers can physically break down and generate dust as they age and undergo multiple handling steps during production, storage, transportation and application. An appropriately designed dust control coating and application system can minimize the problems associated with that dust generation and product deterioration. 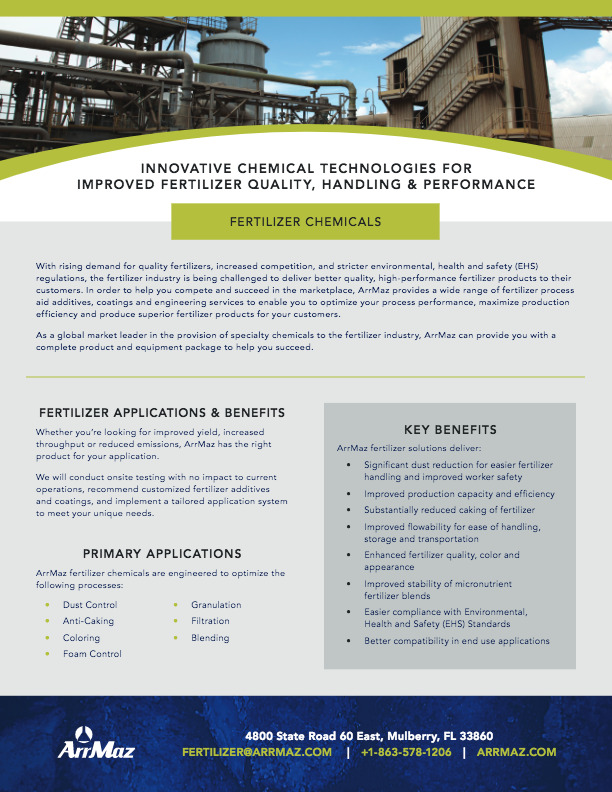 ArrMaz’s DUSTROL® line of products includes dust control coating chemistries which can be custom-formulated to address the specific physical quality needs of any secondary or micronutrient fertilizer. ArrMaz field technicians and engineers routinely provide guidance to customers on the necessary coating application system to be compatible with the coating and the fertilizer, which ensures optimization of the treatment. Segregation is also a significant issue when blending micronutrients with fertilizer due to differences in the size and physical properties such as volume, density and shape of the particles being blended. ArrMaz’s Microstickers™ coating technology, engineered specifically for this purpose, produces stable micronutrient fertilizer blends for up to 90 days. This technology provides consistent, uniform micronutrient distribution on fertilizer surfaces, enhanced color and appearance, and dust suppression characteristics. ArrMaz works closely with our customers to assess production plant needs, conduct micronutrient fertilizer blending formulation development and stability testing, complete engineering design and equipment installation, and provide ongoing technical support to optimize blending performance.